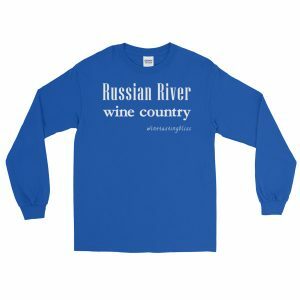 Wine Club Appreciation Weekend in the Russian River area was in full swing! 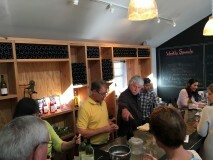 Thirteen wineries along Route 116 had banded together to extend Club Member benefits to any member of a participating winery. What a great idea! We picked up our commemorative glasses at Belletto Vineyards and were ready to experience something new. First on our list? Taft Street Winery! 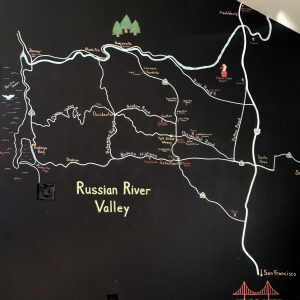 While we were in the Balletto tasting room, we asked our favorite wine guide, Richard, to recommend some participating wineries. The wineries are all great, I’m sure, but our time was limited. Richard kindly recommended a few of his favorites. Taft Street winery was on his “don’t miss” list. On the strength of that recommendation, we set off for Taft, just a short drive down the street. 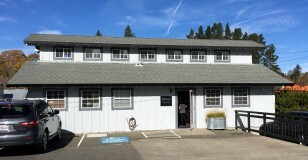 The winery is just off the highway, with plenty of parking. The building itself seemed more like a New England cottage than a winery, but fun tastings come in all sorts of packages. We entered the tasting room to find it abuzz with happy people. And dogs. If anything, the dogs were happier than the people! That says a lot for a tasting room. We found that the winery was serving a very complete tasting menu, paired with Northwest clam chowder. Given my allergies, I passed on the clam chowder, but availed myself of the tasting menu with determination and focus. We met our wine guide Greg, who set us up with their first pour, a 2014 Savugnon Blanc Russian River Valley. We loved the crisp citrus notes and detected a hint of lavender on the nose. Delaynie, not typically a fan of white wines, pronounced this extremely drinkable! We moved on to the 2014 Chardonnay Russian River “Garagistes”, named in honor of the garage that was the starting point for the winery. It had nice acidity and very little of the cloying butter notes that some Chards can deliver. Greg credited the winemaker’s use of “gentle” malolactic fermentation. Whatever the reason, we were all big fans. Next was a 2014 Rosé of Pinot Noir Russian River Valley. Rosé of Pinot Noir seems to be enjoying quite a resurgence in the area, and this wine represented the varietal very well! We liked the mild, dry tannins and an intriguing hint of gummy bear. You don’t taste that very often, but once one of us said it, we all tasted it. About then, we met the owner Sasha and her winery dog, Taj. Meeting Taj explained why all the other dogs were happy. Taj was a very good host. Meeting Sasha explained why everyone was having such a good time. Her enthusiasm and love for wine was contagious. We next tasted the 2013 Pinot Noir Russian River Valley, rich with dark fruit and coffee notes. We’ve been drinking a lot of ’03 – ’06 Pinots at home (it’s hard to explain how we misplaced so much wine, but it happened, don’t judge). This ’13 stacked up well with many of our veterans. Drinkable now, but a great candidate for cellaring for a few years. Our next taste was their 2013 Syrah Russian River Valley. This was quite an interesting tasting experience! The aroma had a hint of Limited Edition Twizzler, yet the flavor didn’t match the nose at all. The dark cherry and plum notes led to a lovely smooth, tannic finish. Quite a nice experience. The only downside was a slightly too energetic swirl in my glass that resulted in an embarrassing “I am a clumsy wine drinker” stain on my shirt. Wine tasting is much more challenging that it appears from a distance! 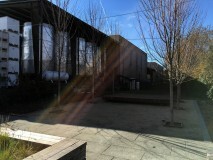 We roamed around the outdoor areas, which were architected for hosting their live music events during the summer. A nice stage, with plenty of room for chairs and even an area for dancing. We finished our Syrah on a bench, soaking up the sun, before returning to the tasting room for a final taste. That final taste was a 2013 Heritage Medallion Red Blend No. 4. We learned that this blend is different every year, in homage to the early days in the garage. We loved the distinct layers of flavor, with dark berries and chocolate nibs woven throughout. A party up front leading to a very dry finish. We had a full agenda of wine tasting ahead of us, otherwise we would have spent the rest of the afternoon at Taft Street. We reluctantly said our goodbyes, purchased an uncharacteristic three bottles of the same wine (the Syrah was just too good to miss and Thanksgiving was around the corner) and set off for our next tasting. 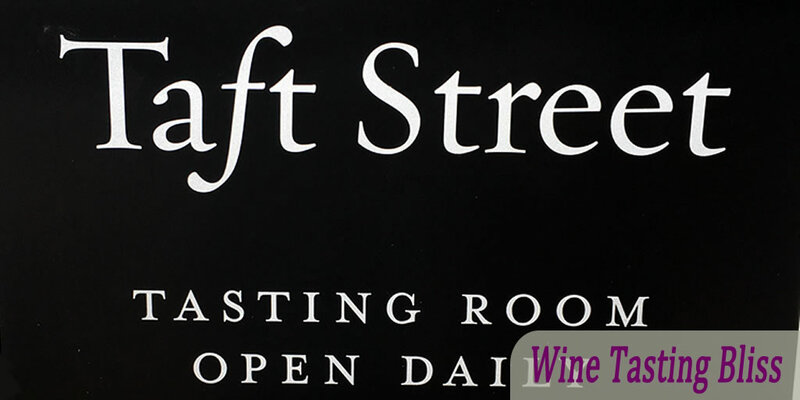 Taft Street Winery is certainly joining our list of regulars. Until next time, cheers! Have you visited Taft Street? Click to give'em a tweet of support! Next Post:What’s in a Wine Glass?